Heat gas or charcoal grill. Soak twine in water to prevent burning. In medium bowl, mix olive oil, lime juice, parsley, garlic, 1/4 teaspoon of the salt, the oregano and pepper flakes. Make 1-inch cut down length of tenderloin; do not cut all the way through. Press sides of tenderloin down so it lies flat. Cover with plastic wrap; pound with flat side of meat mallet to 1/2 inch thick. Spread parsley mixture over tenderloin to within 1/2 inch of edges. Tightly roll up tenderloin lengthwise. Tie tightly with twine. Melt 2 tablespoons of the butter. Brush tenderloin with butter, then rub in chili powder, smoked paprika and 1/2 teaspoon of the salt. Place on grill over medium heat. Cover grill; cook 17 to 22 minutes, turning frequently, until thermometer inserted in center of tenderloin reads 145°F. Transfer to cutting board; cover with foil and let stand 5 minutes. Cut and discard strings. Cut tenderloin into slices with serrated knife. Meanwhile, melt remaining 4 tablespoons butter. Coat corn with butter, and sprinkle with remaining 1/2 teaspoon salt. Grill 4 to 6 minutes, turning frequently, until golden brown on several sides. Top with queso fresco and cilantro. 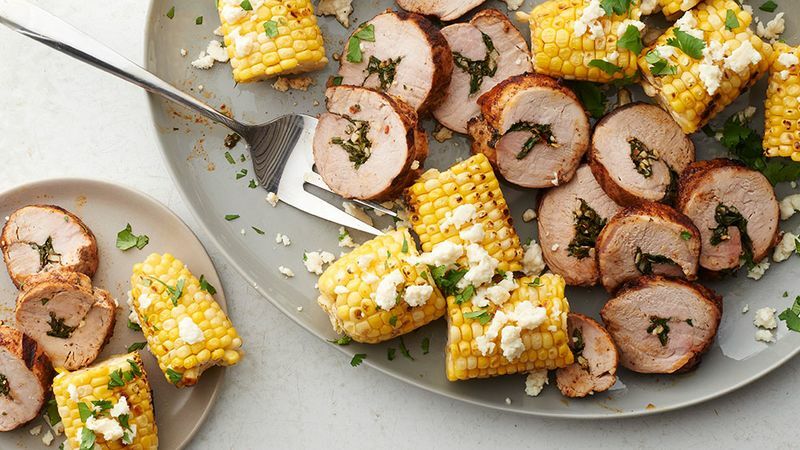 Serve tenderloin with corn and lime wedges. Don’t chop cilantro too far in advance. The beautiful, delicate leaves blacken and wilt easily. Like it hot? Use 1/4 teaspoon more crushed red pepper flakes in the filling.